Capitalising on the publicity generated by the second last film in the Twilight saga, Breaking Yawn, I mean, Breaking Dawn: Part One, the trailer for Kristen Stewart’s forthcoming film, Snow White and the Huntsman, has been released. 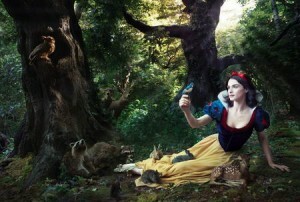 This latest version of a beloved fairytale (one of two – the other is the comical Mirror, Mirror starring Julia Roberts), with Stewart as Snow White, Charlize Theron as the wicked queen and Australian Chris Hemsworth as the huntsman, purports to offer a different spin on a tried and true tale. What’s prompted most commentary is not the violence, the fact the film introduces Snow White as more or less an action heroine, or that the prince is relegated to practical obscurity, so much as punters can’t believe anyone would consider Stewart more beautiful than Theron. Ironically, these superficial comments strike at the heart of the original tale and a universal truth. The queen’s obsession with her mirror is not so much about beauty as it’s about the passage of time and the fact that age wearies us all eventually. Even those whose temporary loveliness allows them to wield extraordinary power must pass the baton to younger generations. That is, unless you have access to magic. Theron and Stewart simply embody, both in fiction and fact, what’s a contemporary reality, especially in Hollywood where female ageing stars (with few exceptions) find it difficult to secure meaningful roles and big salaries. More than ever, youth is beauty. It’s a contemporary currency that doesn’t only give women a sense of longevity it keeps us from becoming redundant. In the Twenty-First century, surgeons are the new wizards and fairies who, with a wave of the magic scalpel, offer the transformations once only possible in the pages of Grimm brothers, Hans Christian Anderson or Charles Perrault. Only now, these modifications occur without the moral lessons; the price they exact is deducted from a bank account. Is Snow White and the Hunstman going to be one of a rare breed of fairytale remakes, where a valuable moral message is imparted, or have the makers opted for the safety of happily ever after instead? In her study of fairytales, Tatar notes the cultural variations in the accounts of Snow White, which appear in Asia, Africa, Europe and the Americas. Considerably bloodthirsty, they feature silver, lead, or jewel-encrusted coffins, apples ingested, suffocating braids, poisoned combs, and the delivery of a variety of the protagonist’s body parts including the lungs, intestines and liver. Despite these departures from the best-known version, the crux of the story remains the same, which is the reason for the narrative constancy and cultural durability of Snow White. It relies on a stable core of binary oppositions to relay the tale: birth and death, expulsion (by the queen)/adoption (by the dwarves), jealousy/affection. It also plays out the generational conflict between mother/step-mother and daughter and their vying for the attention/approval of the father or father figure – absent and present. This latter role is filled by a number of characters from the mirror to the huntsman and the prince. According to Marina Warner, in her marvellous book, From the Beast to the Blonde, in the original Snow White, before the Grimm brothers meddled, there was no step-mother. It was Snow White’s mother who suffered murderous (sexual) jealousy and persecuted her daughter. Shifting these terrible attributes onto a stepparent fitted with prevailing social (and Christian) attitudes of the time. Psychologist, Bruno Bettleheim, explains that tales like Snow White do not “stage scenarios that correspond to real life; rather they dramatize projections of trouble brewing in the young child’s mind.” In other words, like all fairytales, they externalise secret fears to make them manageable, to vanquish the beast. It’s typical that in times of insecurity and crisis we turn to the proven morality of beloved fairytales. Only what will be interesting is what type of morals and lessons these new versions of Snow White offer. Will the mirror, mirror of cinema dare to explore the power and struggles of women beyond beauty, or will it simply represent ageing as a female curse we would do anything to lift? I finally made it to the cinema to see the movie that has people talking: Avatar. A spectacular sci-fi/fantasy action movie with an Aussie, Sam Worthington in the lead and the ‘King of the World’ director, James Cameron, at the helm. I now see why it has people excited. Beautifully shot, using state of the art cinematography and CGI, it transports the audience onto the planet Pandora and into the lives of the indigenous population, the blue-skinned, ten feet tall, Na’vi. The hero of the movie is a disabled, wheelchair bound marine, a ‘grunt’ named Sully who, in a decision based on economic rationalism, takes his dead brother’s place in a scientific research team. This means, he inherits his brother’s avatar – a ‘native’ grown from human and Na’vi DNA which the marine can ‘insert’ himself into. Not only does he have control of his inert limbs in his new form, but he finds a freedom with the Na’vi and on the planet that his military training (brainwashing) did not allow. Instead of a patriarchal and capitalist system, Sully finds a culture in tune with its deity and nature – who are, in essence, one and the same. The environmental thrust of the movie is apparent; the significance of the female is too, not at the expense of the male, but working in tandem. Something Sully learns to appreciate. Romance flourishes in this fertile world – and not just between the characters. Audiences will find it hard not to fall in love with the world portrayed and feel protective about what is threatened. I also enjoyed the moral superiority of the scientists… doesn’t happen all to often in this genre! Whether or not Cameron will win a Best Picture or Director Oscar for this film remains to be seen – no doubt, it will get some technical nods. It’s hard to imagine the Academy awarding a film that represents the military in such a negative light or uses the still raw memory of the collapse of the Twin Towers in an analogous manner to evoke a visceral anti-US response.